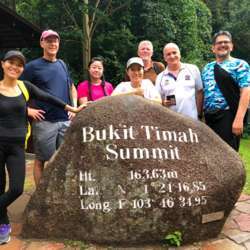 You must be a member of the Singapore Hiking & Brisk Walking Group to attend this activity. Would you like to join this group? We will hike in the Bukit Timah Nature Reserve and up the hill - this is the highest point in Singapore !! Please wear trainers or hiking shoes suitable for dirt / muddy paths and bring some water / sunscreen / hat. The steps are quite steep to the top, however the trail is not tricky or rocky.